However, while Robin Wales may have gone, his legacy and that of the Labour council as a whole remains: a borough with massive debts, the highest level of both homelessness and of overcrowding in London and slum-like temporary housing. Focus E15 is determined not to ease up the pressure, whoever next leads the council. The campaign is working with other local organisations to collectively draw up a Newham People’s Charter. 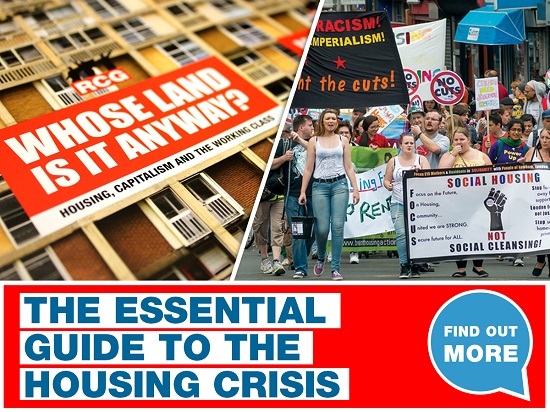 Its demands include repopulating the Carpenters Estate – where at least 400 council homes remain empty; an end to social cleansing; a sustainable programme of council housebuilding and an end to racist immigration raids and attacks on the homeless. We will be presenting it to all candidates in the forthcoming council and mayoral elections and holding all those elected, including the incoming Labour leadership of Newham council, to account. The battle for decent, affordable and safe homes for the working class in Newham goes on. On 23 March, Jomast, the company subcontracted by G4S to provide accommodation for asylum seekers in the north, took Newcastle City Council to tribunal over a number of Environmental Health orders issued by the council. These were a result of consistent campaigning by the Tyneside-based Migration and Asylum Justice Forum (MAJF). Jomast provides accommodation that is severely overcrowded and squalid with bedbugs, broken cookers, leaking ceilings and black mould. Earlier in March, the group picketed the Middlesbrough offices of Jomast – forcing the building to shut for the day. MAJF, which is supported by Fight Racism! Fight Imperialism! North East, coordinated with South Yorkshire Migration Asylum Action Group and North East Coalition for Asylum and Refugee Rights to demand improvements for asylum accommodation calling for an end to forced bedroom sharing which sees unrelated strangers forced to share bedrooms. Last year MAJF pressured Newcastle City Council to conduct inspections of Jomast properties where bedroom sharing was taking place – against council regulations. As a result, the council’s Environmental Health department issued several notices under section 139 of the Housing Act 2004, stating the houses were over-occupied. Now Jomast and G4S have appealed the section 139 notices. The tribunal will rule on the case in early May. If Newcastle council wins, this could be a step towards banning forced bedroom sharing across the region. Offshore-registered developers Delancey have returned to the fray with an amended plan for the Elephant and Castle shopping centre in Southwark, south London. Their original proposals were rejected by Southwark council’s planning committee after a vigorous campaign led by Up the Elephant – launched by the local 35% campaign that has brought together traders, the local Latin American community, students, working class residents and political groups, including the RCG. A number of local Labour councillors have also consistently opposed the plans. The vitality and democracy of the campaign was in evidence at a mass meeting held on 3 March where all were welcome, could speak and propose ways of taking the campaign forward. The meeting categorically rejected Delancey’s revised plan which tinkers with the provision of ‘affordable housing’, hiking up the prices of so-called ‘affordable’ flats to allow a handful of extra homes at social rent. The majority of the new development will still be flats for sale and rent at market prices, and the insulting offer to traders who would be displaced is a temporary boxpark that is way too small and offers no commitment on security of tenancy or affordability of rent. The relocation plan for the bingo hall is unworkable and does not include the bowling alley. The campaign is demanding 35% real affordable housing, made up of half social rent and half London Living rent, with secure tenancies and a proper relocation and compensation deal for traders. Delancey’s amended proposal will go before the council after the May elections. Over the next month, it is essential that we continue to keep the pressure up on Southwark Labour council to reject the planning application. South London RCG will be holding a speak-out at Elephant and Castle on 7 April – we call on all those fighting the Delancey amendments to join us.